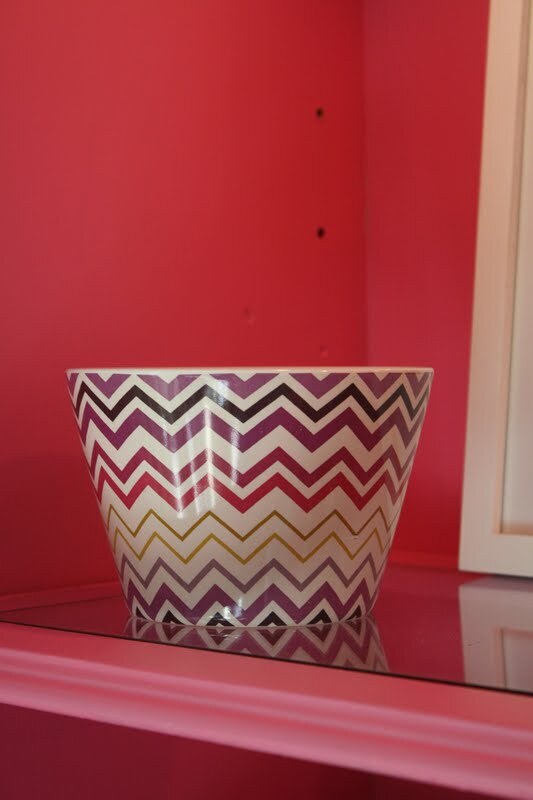 For the LOVE of PINK… MISSONI for Target and ZIG ZAG!!! sweet but sedate cabinet form this…. cost of this makeover – $12.00! is there something that has just been sleeping away, over in the corner that you and a can of paint and 15 minutes could breathe new life into? Well, What are you waiting for!!!! What is the worse thing that could happen? you hate it…you paint it again!!!! 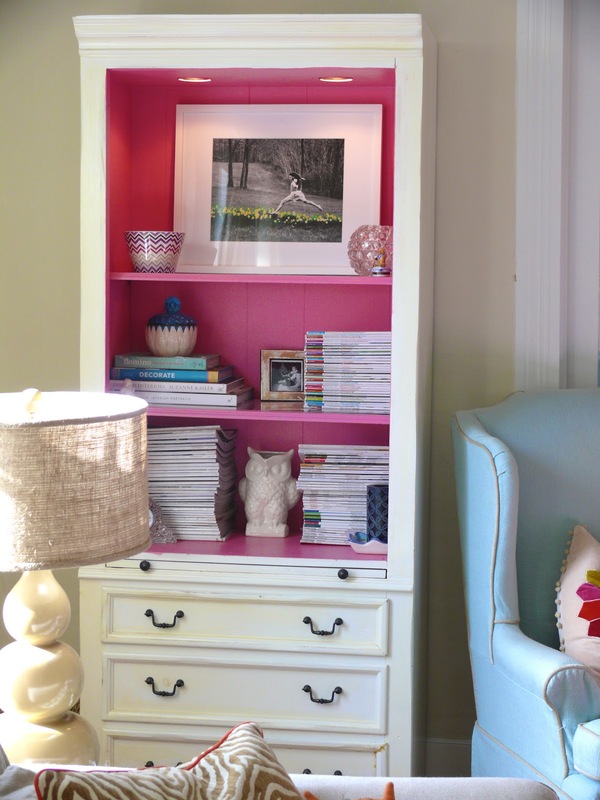 I am in LOVE LOVE LOVE with your painted pink and white bookshelf. I’ve been wanting to do something similar for so long and haven’t been brave enough to do it! LOVE!! I love what you did with your cabinet. I’m going to do mine in white on the outside and turquoise on the inside to go in my bedroom where I painted two of the walls an eggplant (purple). I LOVE LIVING A COLORFUL LIFE. That is fantastic! Good choice on the pink. First – I am so jealous of your Target score. I ended up empty handed. I have never seen anything like that. Second…your room is absolutely awesome. LOVE the pink. I am your latest follower. I found you over at Roomspiration (I am hosting Monday’s leg of Roomspiration). I would love if you would stop by and say hi and consider following me back. Thanks. Thanks for linking up to the roomspiration party today! Thank You so much, You all make me feel so good! And You are all so talented! I love the pink and white combo. I absolutely LOVE it! I too am a pink fan and can’t get enough of pink myself. Your cabinet turned out so pretty. Great job. This is ADORABLE! It’s super chic but also very cozy and friendly. I may have to jump on the bandwagon and paint the inside of a bookcase a bright color because it makes a huge impact and everything inside the bookcase pops. Color me inspired! I love this! What a perfect color! Way to go bold. Thats a terrific color! Love it! I love pink too, and you used it in a fabulous way! I love pink too–you did a lovely job! I love this, it’s so cute! I don’t even normally like pink that much! I love the cabinet! The pink is so rich, but it is not overwhelming. Great job!! wow!! i LOvE the PinK ~ what a bold choice love love love! Um, yes! Yes! YES! I love how it looks with the pop of pink! And your style? Love it!! I love the entire view!! I LOVE this makeover! It was beautiful grey but the pink just completely spices it up. I really want to go paint something hot pink now! Thanks for sharing. I just found your blog and love this makeover! The pink in the cabinet is amazing! I’m now following you! I just found your blog as well and LOVE the bookcase. So darling. So much fun. Following now! That is beautiful!!! Just saw it on pinterest. I have a question on the light and shelving. I just added lights in my shelves in the kitchen but it only lights up the first shelf. I was thinking of adding glass shelves. In the picture it almost looked like your shelves had a light cut out in it. Curious about how you did it. LOVE PINK in an unhealthy way as well!! 🙂 Also LOVE your coffee table~~ did you make it? My husband still shakes head when I ponder the “Oops Paint” at the Depot because I know there will be a treasure… Thank goodness my sister inherited the same “Dumpster Diving Diva” genes!! Thank you for your comments! The coffee table is actually from Ballard Designs! We stand on it…it is perfect for our motley crew! So I have seen this bookcase ALL over Pinterest. I figured I had to check out the blog it belonged to! IT LOOKS GREAT and I love your space. I am your newest follower!! ANGELA, THE coffee table is from Ballard Designs. Keep on dumpster diving! Thanks everyone for all of the great comments! Lesli, I’m obsessed with what you did with your bookcase! The pink is such a great unexpected accent. Do you know the wall paint color in your living room? It is such a pretty, soft color. I would love to add your bookcase to my paint color galleries and include you in a feature. You wouldn’t have to do a thing, just let me know if you’re interested! I love your blog, and we have a few things in common.. I love pink, wear it, paint it.. I have the same cocktail table from Ballard, one of the few things I have bought new, and we have the SAME avocado green 1974 wall ovens! I have had a love hate relationship with them.. this house, a beautiful stone wood ranch built in 1974, ovens are original. Though, I did buy reclaimed Dacor convections at Habitat store to put in this Dec.. I have been here since 1992, older and divorced after 28 years in 08, and re-doing the house bit by bit… I have a good guy friend who is going to help with the ovens.. they are an inch bigger and they do work, we checked. So.. you are not the only one with these ovens, and I have the avocado cooktop too.. Thanks for the inspiration! The Living room wall color is “Spring in Aspen” . I have the “sister” color in the hall called “Feather Down” and “Maritime White”. They are incredibly soothing colors. I love pink! And it follow I love this site. That bookcase is divine, the pink and white one. Such a great idea, I will never look at a “brown” bookcase the same. I will now see them in colors! Thank you. Please follow my blog, comments are so welcomed too. How do you turn on the lights on the top? Just Gorgeous! I love the Pink!!! oohhh…what is Marc’s??? I must find zees marc’s!!! Found you via Pinterest — the pink cabinet makeover. LOVE your style! Found you via Pinterest. The bookcase idea is great!!! I have had your cabinet makeover pinned for many months and was, this weekend, finally inspired to take my own spin on your makeover. 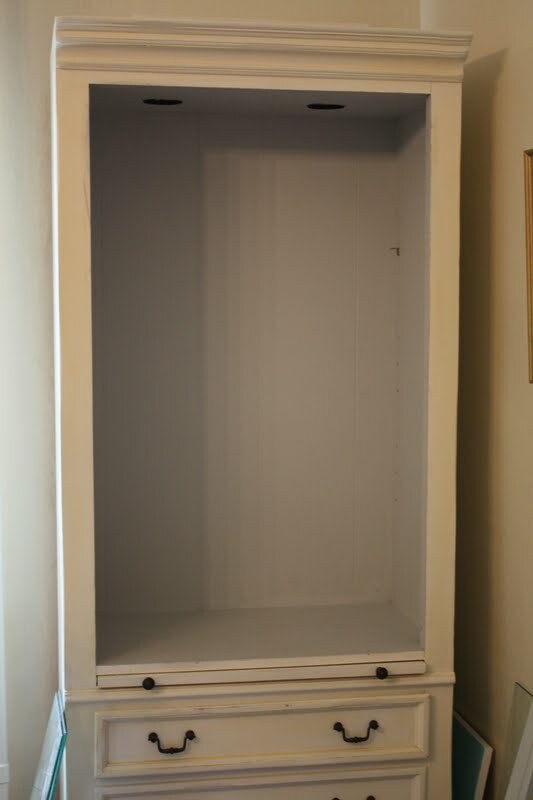 I hope you will stop by and take a look: http://itsalwaysruetten.blogspot.com/2013/01/how-to-cheaply-personalize-bookcase.html. Thank you so much for posting such an inspiring (and well done) DIY. Can you please share what color pink this is? HI !! OMG just came across this gorgeous cabinet, I have the same one practically with a glass door and glass shelves in an ugly fake brown veneer, was going to sell it, NOW I can’t wait to get to it and paint it ! What is the white you used? The pink is springbloom by Benjamin Moore? Previous Post Cows and Goats! SOLD… in New York City!!! Next Post Do come in…Welcome to our Old Country House…THE ENTRYWAY!